« Pre-order Your Autographed Copy Now! Judith Skinner and I will be exhibiting and selling at the Houston International Quilt Festival again this year, and we’d love to meet more readers! I’ll be in booth #2052 under the “Creative Connections” title, and “Judith Skinner, Maker Of Fun Jewelry” will be right beside me in booth #2054, in the Embellishments section. Held in the George R. Brown Convention Center in Houston, Texas from November 3-7, this show is HUGE and features all sorts of incredible textile art, and products with which to do it! We’ll be there with books, including the debut of the brand new title A Collection Of Polymer Clay Masks and our premier release Adapting Quilt Patterns To Polymer Clay. 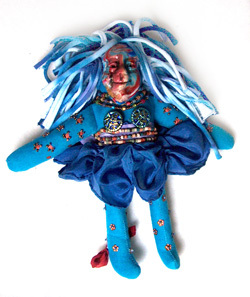 We’ll also have a fantastic array of polymer clay jewelry, beads, polymer, ceramic, and metal faces for using in dolls and wearable art, Spirit Doll Kits, masks, and more! We do this show every year because of the wonderful people and the fabulous things we see there. The works of thousands of modern textile artists from around the world are shown here, with quilts and wall hangings and wearable arts interspersed with artist dolls and vintage textile and needlework collections. If you have any interest in textiles and color, beads and buttons or art dolls–this is a show you will want to see!